A cosy and sleepy coastal village just a short drive from the historical city of Margao, Cavelossim is an oasis of calm in comparison to the bustling city found to its north. 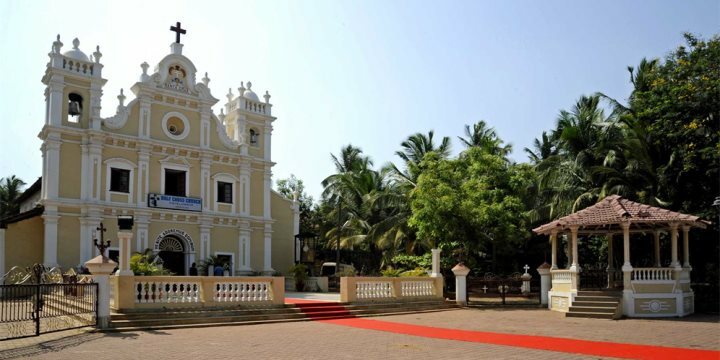 Featuring a handful of restaurants, market stalls and just inland, the pretty Church of the Holy Cross, the basic and unhurried character of Cavelossim is exactly what attracts those on holidays to Goa to settlement beside the Sal River. If you look hard enough however, you will discover adventure around Cavelossim, most notably in the form of a wildlife-spotting boat trip along the water of the Sal River. The beaches are an obvious main draw to the area, where you can do everything from chilling on the sand to parasailing above the ocean. Cavelossim beach is located 200 metres from the village, presenting a long and wide stretch of sand flanked by a few ramshackle eateries which provide much-needed refreshment during the heat of the day. It's also been awarded the fifth best beach in India, in the 2016 Travellers' Choice awards, hosted by TripAdvisor. Please find below a selection of our accommodation in the resort of Cavelossim in South Goa.